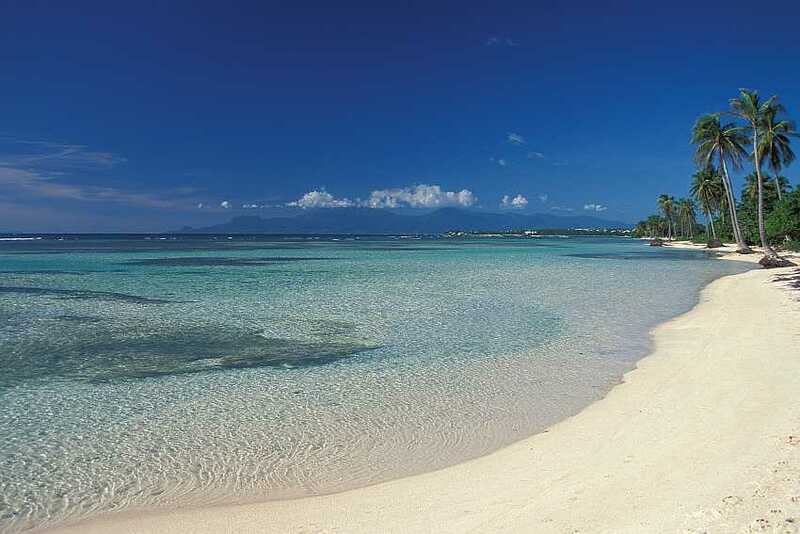 The Caribbean island of Guadeloupe, lovingly called “butterfly island”, is a group of 9 beautiful islands. 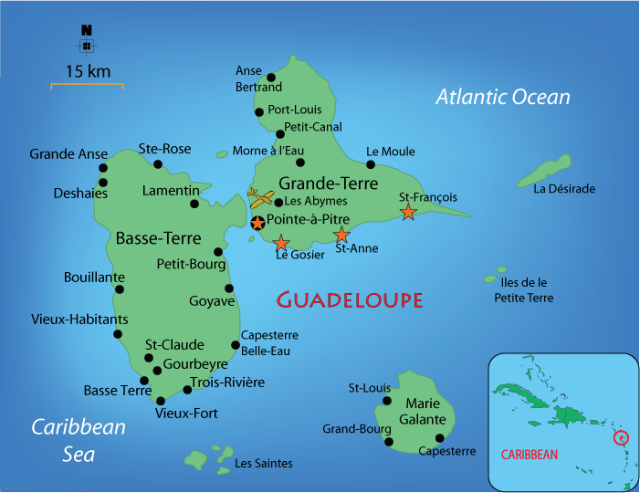 Guadeloupe owes its name to the exceptional arrangement of the two main islands. They are called Basse-Terre and Grand-Terre and together they resemble a butterfly from above. Due to wonderful beaches, historic sights, and delicious local delicacies, there is a lot to discover in Guadeloupe. The two main islands are located close to one another, but offer very different landscapes. 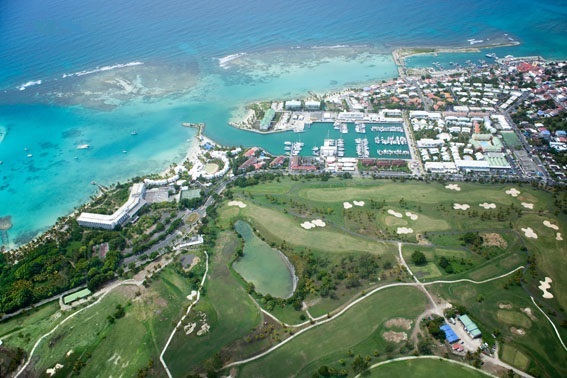 The eastern island of Grand-Terre consists mainly of limestone and flat land. However, the neighboring island of Basse-Terre, located in the west, is much higher due to the volcanic origin. Basse-Terre is home to the highest mountain of the Lesser Antilles, a volcano called “La Soufriere”. The ideal starting point for your sailing trip to Guadeloupe is the Marina Bas-du-Fort in Pointe à Pitre, the capital of Grande-Terre. It is situated only within a 10-minute drive from the airport and it offers all the services a sailor’s heart desires. All berths are equipped with electricity and water connections, showers, toilets and even a supermarket are in the immediate proximity. In the supermarket you can get some food and drinks to equip your boat for your one-week sailing trip. Afterwards, you can explore the city center of Pointe-à-Pitre, which you will reach after a short walk. Pointe-à-Pitre, with its 100,000 inhabitants, is the most important center of the entire island. It will serve as a wonderful starting point for your sailing trip. Visit the impressive Place de la Victoire and see the lovely colonial houses with their iron balconies surrounding the square. The most beautiful building however, is the Office du Tourisme – simply imposing. Continue your stroll to the old harbour of La Darse, which you can already see from afar. The market there has a special flair, because it is located around the harbour. Try one of the fresh fruit and vegetables of the many traders – they’re delicious! After this small exploration tour you might return to Marina Bas-du-Fort. Here you can bring the day to a close by relaxing in a cosy restaurant, trying out fresh fish and delicious wine. But don’t leave too late, you finally set sail tomorrow! Your exciting journey starts the next morning, so you’d better leave directly after breakfast to get the most out of your day. The first destination is Marie Galante, where you have the choice between the two marinas of the island, in Grand-Bourg and Saint-Louis. The beautiful island of Marie Galante is located about 19 nautical miles from Pointe à Pitre and is widely known for the fact that it’s shape is nearly circular. Called “the island of 100 mills”, Marie Galante is famous for its rum production, which started with 100 windmills that were used to squeeze the sugar canes. The island doesn’t hold true to this exact number anymore, but there are still at least 70 small towers remaining on the island. The most famous one of the ruins is the Château Murat, located in the island capital Grand-Bourg. Visiting the mill, you’ll be able to tell the riches the island once possessed. Afterwards, walk up to the small hill next to the mill and you can witness an exceptional view over the open sea. Your next must-see sight is the church Notre Dame de Marie Galante in Grand-Bourg. Built in 1827 it offers an impressive marble altar with a relief of the Last Supper. After a long day and a lot of walking, you definitely earned a little relaxation. Make your way to the beach of Vieux Fort, in the north of Saint Louis. 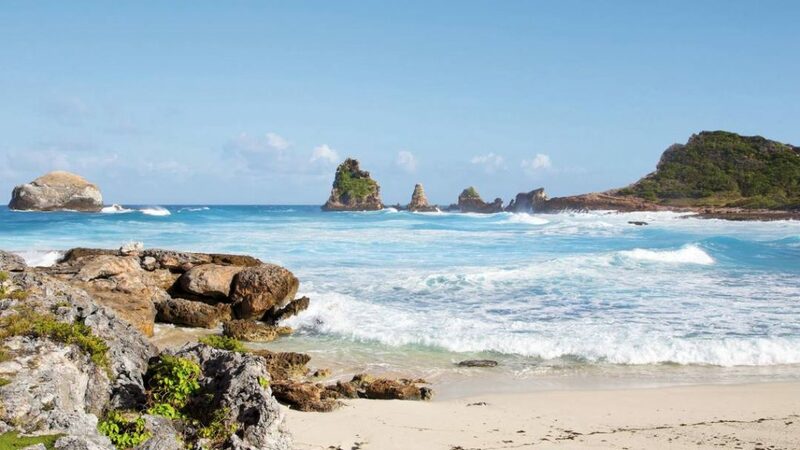 The magnificent long white beach invites you to go for a swim, enjoy the sun, and indulge in the delicious local food at one of the nice restaurants. On the third day, you will sail back to the main island of Grand-Terre, where you will arrive in the Marina of Saint Francois in about 20 nautical miles, so 4 sailing-hours. Once you’re there, you should be on your way to the airport, to go for a once-in-a-lifetime adventure. Book your helicopter tour over Guadeloupe to have the most wonderful view over the entire Caribbean island. This unique sight of the sea, with its beautiful bold colours, will definitely create an everlasting memory. After this exceptional experience, make your way to Pointe des Chateaux. This observation point impresses with its special rock formations and the imposing surge. Finally, dare to go all the way up the hill to have a romantic picnic on the platform, whilst watching the sunset. On your fourth day your next stop is on the south coast of the two main islands. Sainte-Anne is only a few nautical miles away. This island is the perfect place for pure relaxation. Visit the beautiful beach of Bois Jolan, with fine white sand and shaded palm trees. This place is especially suitable for a day at the beach with children. The water is calm and flat due to the coral reefs farther down the bay. If you rather enjoy being active, the beach la Caravelle might be a more suitable option for you. The sea is a little more rough there, so the big selection of watersports is extra fun. Once you decide to move on, sail to the west of the island, to Le Gosier. A special highlight to visit there is the impressive Aquarium de Guadeloupe. It displays the colourful underwater world of the Caribbean sea in 35 different pools. Be it cute little seahorses or threatening sharks, you can see all the animals upfront and close. When you have seen all of the aquarium and you’re getting hungry, take a stroll to the beach Le Gosier. Here, the the excellent beach restaurant Chez Samy awaits you. Be sure to taste the delicacies and the famous brown rum made on the islands, to experience the true Caribbean cuisine. 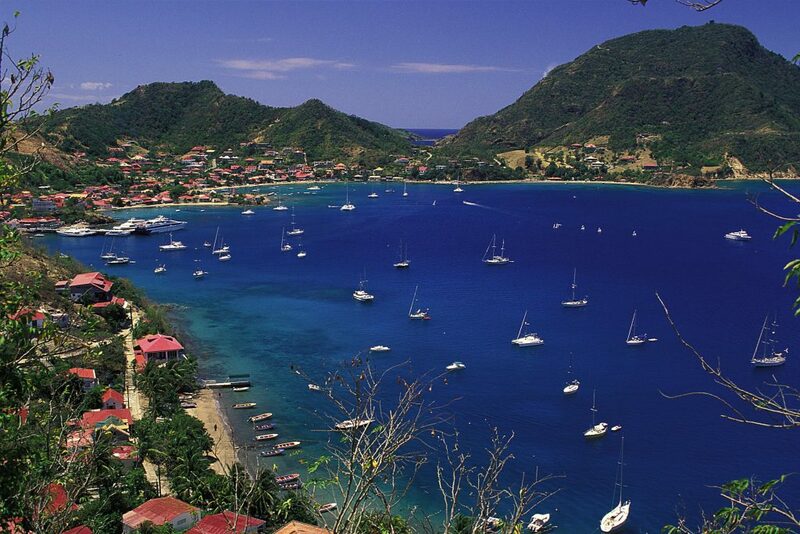 The fifth day of your sailing trip around Guadeloupe will bring you to the Iles des Saintes. After about 25 sea miles you can already spot the unique natural harbour Terre des Hauts from afar. Once you’ve anchored you can explore the charming village afoot. A must-see sight is the historic site of Fort Napoléon des Saintes. The fortress originates from the year 1782, but it is well-preserved. Nowadays the Musee d’Art Moderne is situated within, which is of particular interest for art enthusiasts. Afterwards your path leads you to Anse du Fond Cure, where you can explore the underwater world. Snorkelling is the ideal passtime in the bay. You will spend the penultimate day of your journey in Le Bourges des Saintes. The little village embodies the Caribbean atmosphere. The small alleys invite you to stroll and the many restaurants to host you for dinner on their terraces. To seize the moment you should set sail to Basse-Terre again after noon. There you can enjoy the rest of the day and spend the night aboard, anchored in Marina de Rivière. Make the most out of your last day by exploring the national park on Basse-Terre and its volcano La Soufrière. Take one of the trails around the top of the volcano, that will lead you to the rain forest. It provides the perfect opportunity to experience the sensational tropical flora and fauna. If you prefer letting your holiday come to a close in a relaxing manner, a visit of the Roches Gravees in the Parc Archeologique could be worth your while. They are ancient rock paintings descendent from 300-400 B.C., depicting the settlement in the Caribbean. Not a fan of historic sights? Use the remaining time to go to Jacques Cousteau Underwater Reserve in Couillant. This reserve is an amazing place for snorkelling and diving enthusiasts. The natural hot springs of the island flow into the ocean there and create a terrific play of colours. Before bringing your sailing holiday to a close, you should definitely have a cup of the most famous drink of the islands. Visit the ministry of rum in Saint-Rose, where you will have a once-of-a-kind rum tasting experience. Attend the whole rum production process and try out a variety of different types of rum. What a culmination! We are sure you will leave this journey with many wonderful memories of this Caribbean paradise. Have you already sailed around the Caribbean? Share your experiences with us!